The New Kingdom of the Late Bronze Age. The administration sponsored mineral exploitation of the valley and surrounding desert regions. The early development of an independent writing system. The organization of collective construction and agricultural projects. The ancient Egyptians also had a military intended to defeat foreign enemies and assert Egyptian dominance. Construction techniques that supported the building of monumental pyramids, temples, and obelisks. A practical and effective system of medicine. Irrigation systems and agricultural production techniques. The first known planked boats. The earliest known peace treaty, made with the Hittites. Egypt left a lasting legacy. Its art and architecture were widely copied, and its antiquities carried off to far corners of the world. Its monumental ruins have inspired the imaginations of travelers and writers for centuries. A new-found respect for antiquities and excavations in the early modern period by Europeans and Egyptians led to the scientific investigation of Egyptian civilization and a greater appreciation of its cultural legacy. After reaching the pinnacle of its power in the New Kingdom, during the Ramesside period, ancient Egypt entered a period of slow decline. Egypt was invaded or conquered by a succession of foreign powers, such as the Canaanites/Hyksos, Libyans, the Nubians, the Assyrians, Babylonians, the Achaemenid Persians, and the Macedonians in the Third Intermediate Period and the Late Period of Egypt. In the aftermath of Alexander the Great's death, one of his generals, Ptolemy Soter, established himself as the new ruler of Egypt. This Greek Ptolemaic Kingdom ruled Egypt until 30 BC, when, under Cleopatra, it fell to the Roman Empire and became a Roman province. 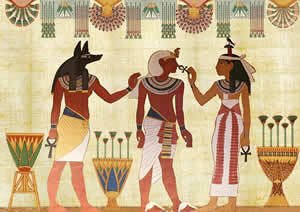 The history of ancient Egypt was characterized by complete stability. Agriculture and a very developed system of administration were essential factors in the success of ancient Egypt civilization. The Middle Kingdom was the last powerful period in the history of ancient Egypt. The Greeks had ruled Egypt before it fell under the rule of the Romans.